· The RC drones continue to fly even its turn off the transmitter, that is why, performs the drone does not work before turning off the Transmitter.This can protect drone not fly uncontrollably. · With HD Camera: Capture and record every beautiful and unforgettable moment. · Strong stability, stronger wind resistance, easier to control. LCD Display: Connect the camera directly after turning on the LCD screen and camera. · Accessories such as camera and smartphone remote holder are not included in the package, as well as batteries required for remote control. 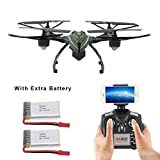 · Spare parts you can buy together: https://www.amazon.es/Mattheytoys-JXD-Quadcopter-Propulsores-protecci%C3%B3n/dp/B01GFD0XDE?ie=UTF8&*Version*=1&*entries*=0 Function: forward / back, left / right, left / right side fly / right side fly, rolled speed, headless mode, one key return, high hold mode, camera, the WIFI image transmission, mobile phones can be controlled. /Budget: Radio required: 6 channels / Gyroscope: 4 axes / Frequency: 2.4 GHz / Flight time: approx. 8-10 minutes / Charging time: approx. 70 minutes / Battery: 3.7V 600mAh rechargeable battery Lipo / Battery controller: 4 x 1.5 V AA batteries (not included) / Distance distance: About 100 meters / Suitable for over 14 years: / Antenna: 5.8G Receiver Antenna /Package Content: Quadcopter * 1 / Remote Control * 1 / Cell Phone Holder * 1 / Spare Blade * 4 / Protection Frame * 4/USB Charging Cable * 1 / Screwdriver * 1 / Spare Batteries * 2In order to ensure the product brand new and can work properlly, our staff will conduct product testing before shipment, so maybe the color box adhesive tape is opened.